An enzyme is a protein that catalyzes and regulates all biochemical reactions within the body. Enzymes function by temporarily binding to reactants (precursors) and lowering the amount of activation energy needed to form the product, thus speeding up the reaction. They are key to human health because most reactions in the body occur too slowly or would result in different products if enzymes were not present. They work by providing alternate pathways of lower activation energy for a reaction and this speeds up the reaction, up to several million times faster. Enzymes are very selective and choose only certain reactants to bind to and will produce specific products, thus showing high levels of specificity. Enzymes are similar to most catalysts and are not consumed by the chemical reaction nor do they alter the balance of the reaction by shifting its equilibrium. They are crucial for digestion and help to break down fats, proteins, sugars, carbohydrates, and fiber. They make available the nutrients and energy locked away in foods while removing the toxins and unwanted products. Enzymes can be grouped into 3 categories: digestive, metabolic, and food. Food enzymes must be obtained orally from food while digestive and metabolic enzymes are produced by the body. Metabolic Enzymes: these enzymes drive our metabolism and provide the basic necessities of the body such as hearing, seeing, feeling, thinking, and moving. They are found in every living cell in the body and speed up the reactions for energy production and detoxification. Vital organs such as the liver, pancreas, gallbladder, as well as others play an important role in their synthesis. Digestive Enzymes: are produced within the digestive system and are secreted to break down food substances to produce nutrients and wastes. This process allows the nutrients to be absorbed within the intestines into the blood stream to be utilized by the body while allowing the waste products to be excreted and discarded. The digestive enzymes include pepsin, trypsin, lipase, protease, amylase as well as others but the enzyme necessary for digesting fiber, cellulase, is not produced by the body. Food Enzymes: are found within the food substance itself and are introduced into the body through the foods we eat. Raw foods contain enzymes that provide digestive capacity by allowing for the breakdown of that particular food item. Enzymes are particularly sensitive to heating and cooking; food processing and cooking destroys these enzymes by altering their shape, making them unable to function. Our bodies must produce the necessary digestive enzymes to break down our food. We often cook our food and eat processed foods thus destroying these enzymes and the enzymes contained within raw foods is only enough to digest that food substance. Enzymes may be used to support digestion, assist with metabolism or provide treatment for disease. The most common form of enzyme used for these purposes are derived from plants or produced by microorganisms. Plant enzymes include protease, lipase, amylase, and cellulase. Plant enzymes are the most active or potent resulting in the highest active units capable of breaking down more protein, fat, and carbohydrates in the broadest range of conditions than other sources. They are used to maintain proper digestion and allow the body to produce more metabolic enzymes by reducing the need to produce digestive enzymes. Alternately, animal sourced enzymes are typically from the pancreas of harvested animals and are used to support digestion. Some microorganisms produce important medically significant enzymes that work towards disease prevention or reversal such as with cardiovascular disease, infection, and sinus or airway conditions. In all, these enzymes may be used to decrease inflammation, reduce clot formation, prevent tumor growth and improve infections, sinusitis, bowel disease, arthritis, lung conditions, wound care, and multiple sclerosis. Amylase: is an isoform (capable of different forms) enzyme that is capable of digesting starches into maltose, glucose and dextrin. It is produced by the salivary glands where it is released during mastication (chewing) and also by the pancreas. Plants are also capable of producing this enzyme, where it is synthesized during the ripening stage of fruit and the germination stage of grains. Supplementation benefits the digestion of starchy foods such as breads, cereals, potatoes, and pastas. The unit of measure of its activity is DU (alpha-amylase dextrinizing unit). Bromelain: Bromelain is a collection of proteolytic (protein breaking) enzymes derived from pineapple. They have a broad range of activity in varying environments and are active throughout the various locations of the digestive system. They have been used extensively both commercially as meat tenderizers and medically to assist both the digestive process and the immune system, reduce inflammation, and support the cardiovascular system and general health. It acts by blocking pro-inflammatory metabolites that propagate the inflammatory process. It has been used to treat sports injuries, traumas, arthritis, and other forms of inflammation. Additionally, medical research supports its use in digestive problems, phlebitis, sinusitis, post surgery wound healing, arthritis, chronic venous insufficiency, gout, hemorrhoids, ulcerative colitis, blood clots, menstrual pains and autoimmune disorders. The unit of measure of activity is PU (papain unit) or GDU (Gelatin Digesting Units). Catalase: functions by converting hydrogen peroxide (a destructive and powerful oxidative molecule) to oxygen and water. Catalase has been used as a supplement for antioxidant, anti-inflammatory, immune and cardiovascular support. The unit of measure of its activity is the Baker Unit. Cellulase: is a complex of different enzymes, which break down the plant cell wall constituent cellulose into glucose. The rigidity of most plants is primarily due to the complex carbohydrate cellulose. Humans are not capable of digesting cellulose and are thus unable to use most of the energy contained in plants. Supplementation with cellulose allows for the digestion of cellulose, which provides added nutrition and reduces the bulking effect of fibrous foods. The unit of measure of activity of cellulase is CU (cellulase unit). Chymotrypsin: is a protein digesting enzyme similar to trypsin. It is produced within the pancreas as a precursor enzyme and is activated within the small intestine during digestion. Supplemental chymotrypsin works together with endogenous chymotrypsin to improve protein digestion and can benefit the digestive, immune and cardiovascular systems. The unit of measure of its activity is USP CU (USP Chymotrypsin Unit). Glucoamylase: is a multifunctional enzyme that breaks down amylase, isomaltose, and dextrins (components of starch) into glucose molecules. It works in unison with glucoamylase present within the body to enhance the digestion of carbohydrate rich foods. Most of this enzyme is produced commercially by the fungal species Aspergillus niger and used by the food processing and health supplement industries. Their use benefits the digestion and supports general nutrition. The unit of measure of its activity is AGU (amyoglucosidase Activity Unit). Hemicellulase: are enzymes that hydrolyze plant fibers consumed in the diet. Normally these fibers are not digestable since humans are unable to produce hemicellulase, thus supplementation provides for a means to digest and extract important nutrients and reduce the bulking effect of certain fibrous foods. The units of measure of its activity is HCU (hemicellulase Unit). Invertase: is an enzyme that breaks apart sucrose into glucose and fructose. It has been used in the food processing industry as a method of converting sucrose into the sweeter and more manageable fructose sugar. Clinical evidence suggests that it is beneficial for digestion and nutritional support. The unit of measure of activity for invertase is INVU (Invertase Unit). Lactase: is a well known enzyme that breaks down lactose sugar into galactose and glucose sugars. Lactose is familiarly known as a component in milk or dairy and the enzyme has been used frequently for lactose intolerant individuals. Lactase is present in humans within the cell lining of the small intestines but adults commonly become deficient in this enzyme. It has been used commercially both to break down lactose in milk products for lactose intolerant individuals and also to produce sweeter milk products by breaking lactose into its sweeter constituents. Lactase use increases the digestion of dairy products by supporting the endogenous human lactase enzyme present and thus reduces the symptoms of lactose intolerance. Supplementation supports digestion and general nutrition. The units of measure of its activity is ALU (acid Lactase Unit) or NLU (neutral Lactase Unit). Lipase: is a water-soluble, lipid-digesting enzyme that is capable of breaking down fats and oils, converting these fats or triglycerides into monoglycerides and free fatty acids. They are found throughout the body in most cells where they perform this function, a necessary process for energy maintenance, cell signaling and membrane structure. Pancreatic lipase is produced by the pancreas and secreted in response to a fatty meal. Other forms are: hepatic lipase, which regulates the level of fats in the blood and pharyngeal lipase, which is released into the mouth and acts within the stomach. Supplementation increases the ability of the body to digest fatty meals and promotes overall health. The units of measure of its activity is LU (lipase unit). Lysozyme: is derived from animal sources and catalyzes the cell walls of certain microorganisms thus breaking them down. It has been used for its anti-microbial and immune supportive properties. Nattokinase: is a potent enzyme capable of breaking down fibrin (a protein involved in clot formation). The origin of the enzyme is from natto, a Japanese food created by the addition of Bacillus natto to boiled soybeans, which are then allowed to ferment. It is specifically through this process of soy fermentation that nattokinase is produced, although there are other fermented soy products containing alternate enzymes. Much research has been conducted into the effects of this enzyme on human health in particular its role in cardiovascular disease. Nattokinase has been studied for its ability to dissolve thrombus (blood clots), thus reducing their destructive effects on the heart and brain. It increases the body’s natural ability to break apart blood clots by enhancing the effects of plasmin (the body’s natural thrombolytic agent) through its increased production and also by its ability to act directly to dissolve fibrin. Another benefit of nattokinase is its long duration of activity compared to traditional antithrombin drugs (acting for 8 to 12 hours after administration). Supplementation of nattokinase may be beneficial in the treatment of cerebral infarction (stroke), cardiac infarction (heart attack), angina pectoris, hemorrhoids, and vascular related diseases such as dementia and diabetes. Nattokinase should not be used if bleeding disorders are present and caution should be used with concomitant use of blood thinners such as aspirin or warfarin. The common unit of measurement of its activity is FU (fibrinolytic Units). 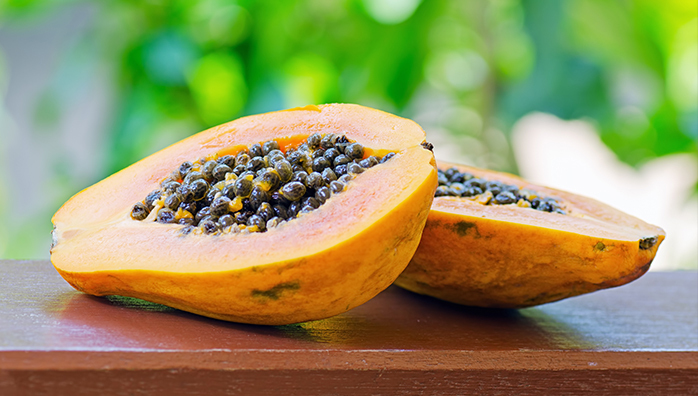 Papain: is a mixture of proteolytic enzymes derived from papayas. They function over a broad range of environments and are active throughout the various locations of the digestive system. Similar to bromelain, they have been used as meat tenderizers as well as in medical research. They have been studied for their various health promoting effects and digestive enhancing ability. Research conducted using papain has shown that it reduces inflammation associated with arthritis; can be used as an adjunct in cancer treatment to increase the response to treatment and reduce the effects of radiation and chemotherapy; can be used in wound debridement and healing; has shown benefit in autoimmune diseases and myasthenia gravis; and can be used to treat herpes zoster infection (shingles). The unit of measure of its activity is PU (papain unit). Pectinase: are a group of enzymes that break down the plant cell wall component pectin. They are frequently used in the processing of fruit juices such as apple juice. Humans do not produce this enzyme and thus require it from exogenous sources in order to digest pectin. Supplementation of pectinase has been used to support digestion and improve general nutrition. The units of measure of its activity are Endo-PG (endopolygalacturonase activity). Pepsin: is an enzyme that hydrolyzes most proteins by acting on its carboxylic group (part of an amino acid composing protein). Pepsin is formed from its pro-form enzyme pepsinogen, which is activated by the presence of an acidic environment resulting from hydrochloric acid secretion. It is stored within the body as pepsinogen and released as needed under control of a key hormone and nerve enervation. Supplementation of pepsin works in cooperation with endogenous pepsin to digest proteins in the small intestine and have been used to support digestion, immune system, cardiovascular system, and general nutrition. The unit of measurement of its activity is Pepsin Unit. Phytase: are enzymes that break down indigestible phytic acid (phytate) found in plant material, thus releasing important nutrients. They have been used to support digestion and promote general nutrition and health. The unit of measure of its activity is FTU (Fytase Unit). Protease: are enzymes responsible for breaking down protein consumed in the diet into absorbable parts. Protease enzymes are useful supplements for digestion, anti-inflammatory properties, and immune, cardiovascular, and general nutrition support. The unit of measure of activity is HUT (hemoglobin Unit on the Tyrosine basis) or AACC. Serratiopeptidase or Serrapeptase: is a proteolytic enzyme that originally was isolated from the digestive tracts of the silkworm but is now commercially produced by the microorganism Serratia. Serrapeptase digests non-living tissue, clots, cysts, and arterial plaque, thus demonstrating numerous medical benefits and instigating much clinical research. The enzyme can protect against strokes and heart disease by removing plaque accumulations within arteries and decreasing inflammation. Research has shown that it is an effective treatment for heart disease, blood clots, varicose veins, inflammatory disease, breast engorgement, respiratory disease, chronic sinusitis, and can reduce edema (fluid accumulation and swelling), post operative swelling and increase the effectiveness of antibiotics to fight infection. Its use has been associated with subepidermal bullous dermatosis (a blistering skin disease) and acute eosiniphilic pneumonia( a type of pneumonia), though very few cases have been reported. The unit of measure of its activity is SPU (Serratia peptidase unit). Superoxide Dismutase (SOD): is an enzyme that destroys superoxide free radicals (highly reactive oxygen molecules) and is a defensive enzyme present in all cells exposed to oxygen. Their presence helps to protect against damage that occurs in the aging process and from ischemic disease. They also prevent damage to DNA, reduce ionizing radiation damage and prevent fat oxidation, protein denaturation and other forms of progressive cell degeneration. When supplemented, they work in unison with SOD present within the body to prevent oxidative damage from free radicals. They have been used for their anti-oxidant, anti-inflammatory, immune system and cardiovascular supportive properties. Trypsin: is part of a family of protease enzymes that fragment proteins. It is termed an endopeptidase because it cleaves within the protein strand instead of at the ends. It is produced within the pancreas and released as an inactive form to be activated within the small intestine. Supplementation works to enhance the capacity to digest proteins and their use can benefit the digestive, immune, and cardiovascular systems to promote overall health. The unit of measure of its activity is USP Trypsin Unit. Xylanase: reacts with the indigestible parts of plant fiber called xylans. Humans do not produce the enzyme necessary for this reaction and must obtain them in a supplemental form. These enzymes have been used for their digestive and general nutritional support roles. The unit of measure of its activity is Xylanase activity. How is activity measured for different enzymes? Most enzymes have their own standardized units of activity. The activity units used are based on the Food Chemical Codex (FCC) and are published by the National Academy Press, which is the accepted standard. However, the printed activity units of many enzymes may vary making comparison between enzyme products difficult. When comparing plant to animal enzymes the former nomenclature is used while animal enzymes (or glandulars) are represented by USP. In general, the activity of plant based enzymes is greater than their equivalent animal based enzymes (usually derived from pancreatin). Furthermore, plant based enzymes function over a broader range of pH (the measure of acidity and alkalinity) and also act for a longer duration, since they are active within the stomach and remain active within the intestines. 1. Prochaska LJ; Nguyen XT; Donat N; Piekutowski WV. Effects of food processing on the thermodynamic and nutritive value of foods: literature and database survey. Med Hypotheses 2000 Feb; Vol. 54 (2), pp. 254-62. 2. Prochaska LJ; Piekutowski WV. On the synergistic effects of enzymes in food with enzymes in the human body. A literature survey and analytical report. Med Hypotheses 1994 Jun; Vol. 42 (6), pp. 355-62. 6. Braun JM; Schneider B; Beuth HJ. Therapeutic use, efficiency and safety of the proteolytic pineapple enzyme Bromelain-POS in children with acute sinusitis in Germany. In Vivo 2005 Mar-Apr; Vol. 19 (2), pp. 417-21. 9. Mialovyts’ka OASource:Likars’ka Sprava / Ministerstvo Okhorony Zdorov’ia Ukraïny. Effect of phlogenzym in long-term treatment of patients with multiple sclerosis. Lik Sprava 2003 Apr-Jun (3-4), pp. 109-13. 12. Maurer HR. Bromelain: biochemistry, pharmacology and medical use. Cell Mol Life Sci 2001 Aug; Vol. 58 (9), pp. 1234-45. 17. Nakamura S; Hashimoto Y; Mikami M; Yamanaka E; Soma T; Hino M; Azuma A; Kudoh S. Effect of the proteolytic enzyme serrapeptase in patients with chronic airway disease. Respirology 2003 Sep; Vol. 8 (3), pp. 316-20. 18. Sasaki S; Kawanami R; Motizuki Y; Nakahara Y; Kawamura T; Tanaka A; Watanabe S. Serrapeptase-induced lung injury manifesting as acute eosiniphilic pneumonia. Nihon Kokyuki Gakkai Zasshi 2000 Jul; Vol. 38 (7), pp. 540-4. 19. Shimizu H; Ueda M; Takai T; Bito T; Ichihashi M; Muramatsu T; Shirai T. A case of serratiopeptidase-induced subepidermal bullous dermatosis. Br J Dermatol] 1999 Dec; Vol. 141 (6), pp. 1139-40. 20. Mazzone A; Catalani M; Costanzo M; Drusian A; Mandoli A; Russo S; Guarini E; Vesperini G. Evaluation of Serratia peptidase in acute or chronic inflammation of otorhinolaryngology pathology: a multicentre, double-blind, randomized trial versus placebo. J Int Med Res 1990 Sep-Oct; Vol. 18 (5), pp. 379-88. 23. Fujita M; Hong K; Ito Y; Fujii R; Kariya K; Nishimuro S. Thrombolytic effect of nattokinase on a chemically induced thrombosis model in rat. Biol Pharm Bull 1995 Oct; Vol. 18 (10), pp. 1387-91. 26. Maruyama M, Sumi H. Effect of Natto Diet on Blood Pressure. JTTAS, 1995. 27. Sumi H, Hamada H, Nakanishi K, Hiratani H. Enhancement of the fibrinolytic activity in plasma by oral administration of nattokinase. Acta Haematol 1990;84(3):139-43. 29. Journal of Fibronolysis and Thrombolysis. Abstracts of the ninth international congress on fibrinolysis, Amsterdam, 1988, Vol.2, Sup.1:67. 30. Sumi H, Hamada H, Tsushima H, Mihara H, Muraki H. A novel fibrinolytic enzyme (nattokinase) in the vegetable cheese Natto; a typical and popular soybean food in the Japanese diet. Experientia 1987, Oct 15;43(10):1110-1. 31. Sumi H. Healthy Microbe “Bacillus natto”. Japan Bio Science Laboratory Co. Ltd.
32. Sumi H. Interview With Doctor of Medicine Hiroyuki Sumi. Japan Bio Science Laboratory Co. Ltd. 8. Sumi H. Structure and Fibronolytic Properties of Nattokinase. 33. Prevent Heart Attack and Stroke with Potent Enzyme that Dissolves Deadly Blood Clots in Hours. Health Sciences Institute, March 2002.